On January 29, 2015 Mark Blunk and I prepared a workshop on IPython Notebooks, Matplotlib and Basemap held at Ada Developers Academy and sponsored by PyLadies Seattle. This blog goes over the Matplotlib and Basemap components of the workshop. 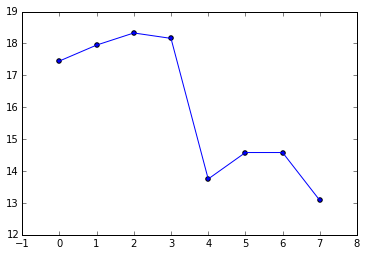 The code, contained within Ipython notebooks, are located in this Github Repo. 1. Getting to the Basics -- Data Structures -- Brief overview of the data structures used in this workshop. 2. Prepare the data -- Prepare our data for plotting. 3. Time to Plot! General Scatter Plots -- Make some simple scatter plots and learn how to change their attributes. 4. Histograms! 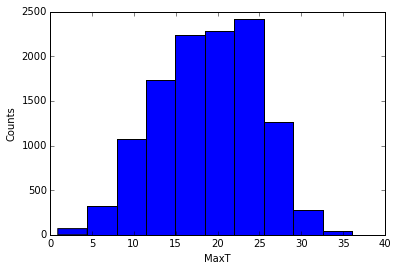 -- Make some simple histograms and learn about how to extract information from them. 5. Mapping -- Make some maps, and let's throw some data on them too! 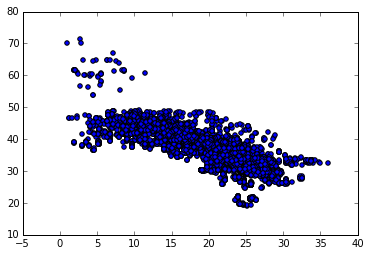 I thought it would be fun to work with real data instead of some randomly generated data. The data we will use are modeled weather forecasts at weather stations across the United States. This information was collected from the OpenWeatherMap project who provides an API service to download weather forecasts, but unfortunately, does not keep a historical record of the forecasts (actual observations, yes, but modeled forecasts no). David Branner and I were curious about how accurate the forecasts were, and wanted to keep the forecasts to see how well they perform over time. Hence, we created a database that collects the weather forecasts for these stations. 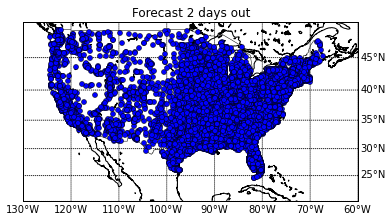 The file target_day_20140422.dat that is in the Github repo for this workshop was extracted from our database and contains weather forecasts for each station in the United States for the 'target day' of April 22, 2014. The stations themselves are defined by their latitude and longitude and the file contains forecasts that were done 0 to 7 days out, where day zero is the forecast made on April 22, 2014. 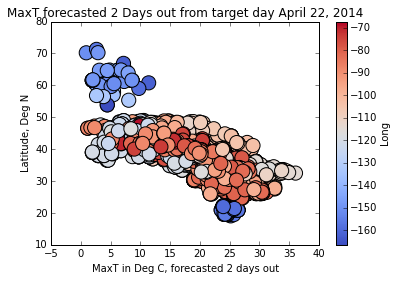 Hence a forecast made one day out was made on April 21, two days out April 20th, etc. A basic understanding of data structures is useful when playing with and visualizing data. If you are already familiar with data structures you can skip ahead to 2. Prepare the data. In computer science, a data structure is a way to organize data in a computer that makes it computationally efficient. Three basic data structures are used in this workshop: lists, tuples and dictionaries. The example d above has two lists as elements. d is called a list of lists. Now you try -- What is c? How about d? 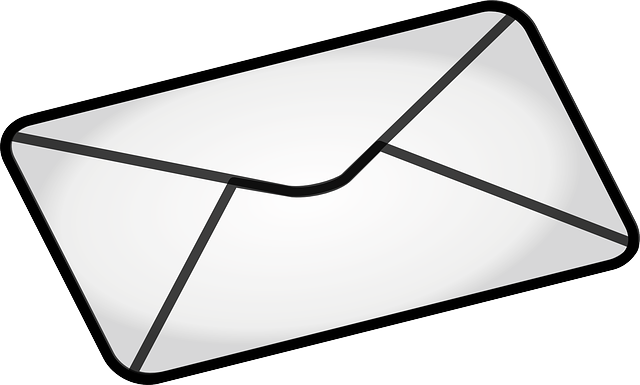 Great things about lists are that they are very simple to understand, and they take up relatively little amounts of memory. However they do have some limitations. Say if you have a long list of values, but you wanted to see if a certain value is in the list. You potentially would have to read through all the items in the list in order to see if it is in there. Hence, it can be computationally slow. This would produce the output of 41. Tuples seem a lot more restrictive than a list, so you may ask, why would you ever use a tuple? Tuples are useful when you would like to describe something that needs multiple values to make sense, and these values cannot change. 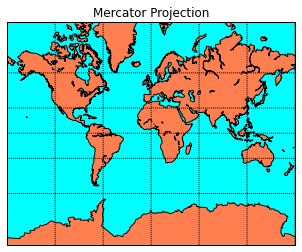 For example, you can create a tuple of a location on the surface of the earth that contains a latitude and longitude. The location would not make sense if one of those values were wrong or missing. Hence, having an immutable property that describes its location is appropriate in this case. Get it? If you need more help, I've put together a post on dictionaries here. The great thing about dictionaries is that we can have a lot of data, but if we know the key, we can very quickly get the associated values. If this information were in a list, it could take a long time to read through the list to get to the value you want. The down side however, is that dictionaries could take up a lot of memory, but that's not a problem in this excersize on most modern computers. Couple of things here -- we have a list of strings, where the end of the string is marked with an 'n'. This marker indicates that it is the end of the line in the file and will need to be accounted for when we ingest the data into a useable form. 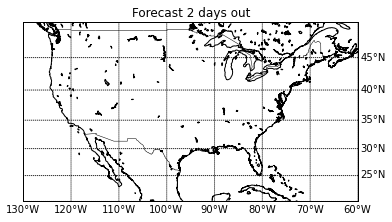 The output above shows the forecasted Max T and Min T values for 0-7 days prior for a specific station at Latitude 40.51218N, Longitude -111.47435E. Click here for more marker fun, and more info on pretty-ing up lines can be found here. 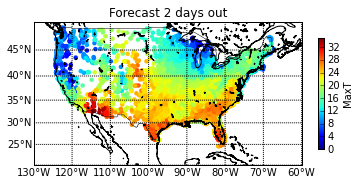 Let's do another plot and this time look at all of the Max Temperature forecasts 2 days out, and plot them with respect to Latitude. We will need to pick out from forecast_dict all the Max T values for all of the weather stations made 2 days before April 22, 2014. First, we will need to get all the Latitudes and Longitudes for each site, then we will need to pick out all the Max T values for each of the stations for that day. Click here for more color mapping fun. Now let's try again and jazz it up... Let's increase the number of bins (bin size calculated by the difference Min and Max values, divided by the number of bins). Let's also change the color of the bars and make them a little translucent. And patches are a list of the matplotlib rectangle shapes that make the bins. Now that we have the basics down, let's start with mapping! We will be using Matplotlib's basemap: http://matplotlib.org/basemap/. # Define the projection, scale, the corners of the map, and the resolution. llcrnrlat,llcrnrlon,urcrnrlat,urcrnrlon are the lat/lon values of the lower left and upper right corners of the map. lat_ts is the latitude of true scale. resolution = 'c' means use crude resolution coastlines. # Color the transformed points! In the first graph -- include the weather forecast through time for multiple stations. Color each set of lines differently for each weather station. Also color the points differently for each. In the second graph -- Try creating a figure with subplots and show the forecasted Max Temperature and forecasted Min Temperature as a function of Latitude side by side. 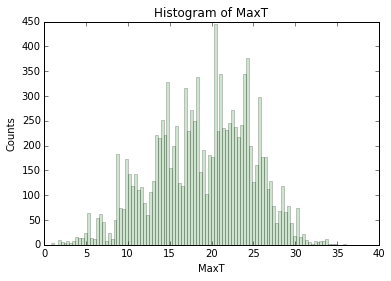 In the histogram -- Try overlaying a histogram with of the distribution of Max T values for day 2 with the distribution of Min T values for the same day. For the map -- Create a figure with multiple maps, where each map shows the forecasted distribution of temperature for each day out. Change the location of labels. 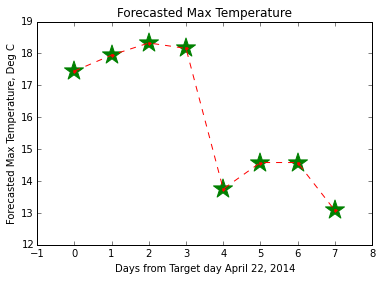 What is the difference of the temperature forecast made April 22, 2014 with the previous forecast days? Can you map the differences? That's it for this workshop! Hope you had fun, and I would love to see what you come up with! Interested in using the notebooks? Check out my Github page which includes the codes, data and instructions on how to use them. Any comments or suggestions are welcome! Thanks to PyLadies Seattle, specifically Erin Shellman and Wendy Grus for organizing this fun little workshop! Also many thanks to Ada Developers Academy for providing the space.